Yank's Franks ~ The Next Health Food Craze? We've all heard the health warnings about nitrates or nitrites in such foods as bacon, ham, sausages and hot dogs. This perception was bolstered in the 1970's by research conducted at MIT. Wow, coming from such a prestigious institution of higher learning, this conclusion is very damning to these foods. As Paul Harvey used to say, "and now, the rest of the story." As revealed in her blog, Junkfood Science, Sandy Szwarc identifies the source of misinformation about nitrates as a 1970's MIT research report that was later discredited as faulty by scientists at the FDA, USDA and NIH among others. Imagine that, those pompous MIT fools proved nothing more than their own incompetence, yet the scare they perpetrated lasts until this day. Sandy Szwarc's article continues with many startling (and positive) facts about nitrates. Unlike those Cambridge, Mass. jokers, these facts are backed by legitimate studies. I've always thought that MIT real estate along the Charles River would make beautiful condos. Now, it appears that a condo conversion may do a service to mankind. Okay, that's a bit much, but it would do a service to hotdoggers everywhere. Hopefully the bottom floor of those condos will be retail. That would make an awesome Yank's Franks location. Frankly, we serve the BEST (and healthiest) dogs! Our field trip yesterday took us north to Rockland, Maine the home of Wasses Hot Dogs. When we arrived at about 3:00, we were the only people there. Unfortunately for us several customers stopped within minutes. I say unfortunately because I was hoping to have more time to quiz the Wasses people about some of their products. Anyway, The Hot Dog King gave me his order while he snapped photos. For The HDK it was a dog with mustard and onions (sauteed). I asked one of the Wasses people what their famous dog was. She replied, "a dog with mustard, relish and onions." The other person in the kitchen quickly blurted out, "that's not my favorite, my favorite is bacon, mustard, onions and hot relish." I couldn't resist and that's what I ordered. Since we had already eaten lunch (at the famous Moody Diner), Hot Diggity and Double Dog Dennis remained in the car while we dined. Well, not so much dined as wolfed down. You see, the temperature was about 10 degrees outside and I wasn't looking forward to wearing this delicious snack so eating in the car wasn't a good option. The Hot Dog King said his dog was fantastic. As you can see from the photo, both dogs looked amazing. (click on the photo and it should give you a larger view) If you're not hungry after looking at these dogs, what are you doing reading my blog? My hot dog was excellent. I do have just a couple of critiques, but don't let them distract from the fact that it was a really awesome hot dog. The only two things I would change...one, as many of you know, I don't like the soggy steamed buns. Please, take a minute and toast them. And two, the nacho style cheese on top is not a favorite. To me this cheese is neither good nor bad. It has so little flavor that I can't say it distracted from the overall taste of the dog, but a more flavorful cheese would have been spectacular. Having said that I come back to the fact that the dog was excellent, it was grilled to perfection and the other toppings were just right. The addition of a couple of Chocolate Milks was a nice touch to wash it all down. The Hot Dog King thinks we should add Chocolate Milk to the Yank's Franks menu. You see, this research does pay off. Now I can't wait for our next trip to Rockland. Frankly, Yank's Franks has the BEST field trips! Hot Diggity and I stumbled upon a Johnny Rockets this past Sunday. Normally such a find would result in a spirited "Yahoo" from me, but unfortunately we had just finished lunch at a different restaurant. I only had enough room for one of Johnny Rockets awesome milk shakes. The thought of a Johnny Rockets' burger danced through my hungry brain for the last several days until today, I was able to convince Hot Diggity, Double Dog Dennis and The Hot Dog King to join me for a mini-field trip back up to Freeport. In addition to our burgers and fries, I ordered the chili dog and we all split an order of rings. As you may know, my standard by which all hot dog joints are judged is the chili dog. Others often choose the simple plain hot dog or hot dog with yellow mustard, but my sense of taste and ability to discern the subtle variances in spices and flavors is highly sensitive and extremely sophisticated. (are you buying this?) Plus, I love chili dogs. Well, I will stop slinging the bull and get right down to the review. The burgers were excellent! Everyone agreed, however Hot Diggity ordered the patty melt and was disappointed with the preparation of the bread. 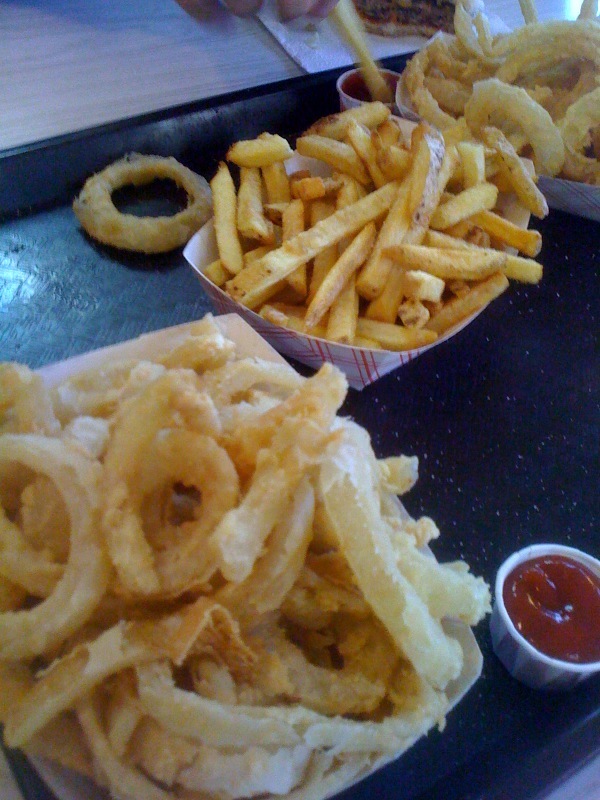 The onion rings were unusual in that the coating was made from sourdough breading. Excellent! 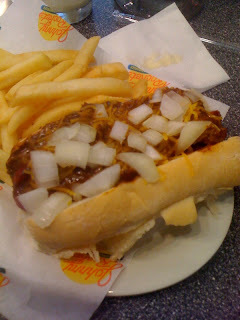 The chili dog was great... great dog, great chili. I'll definitely get one the next time I go. Now for the "not as good news" The french fries were not that good. Hey Mr. Rocket, if you're listening, it's an easy fix. I noticed your deep fryer is automatically set to cook for 3 minutes. Set that baby to 4 minutes and you'll have some killer fries. Easy peasey, lemon sqeezey. 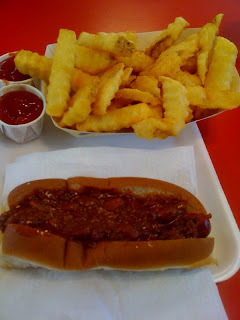 Frankly, Yank's Franks serves the BEST dogs (and rings and fries)! Don't let that stop you when you're in Freeport. 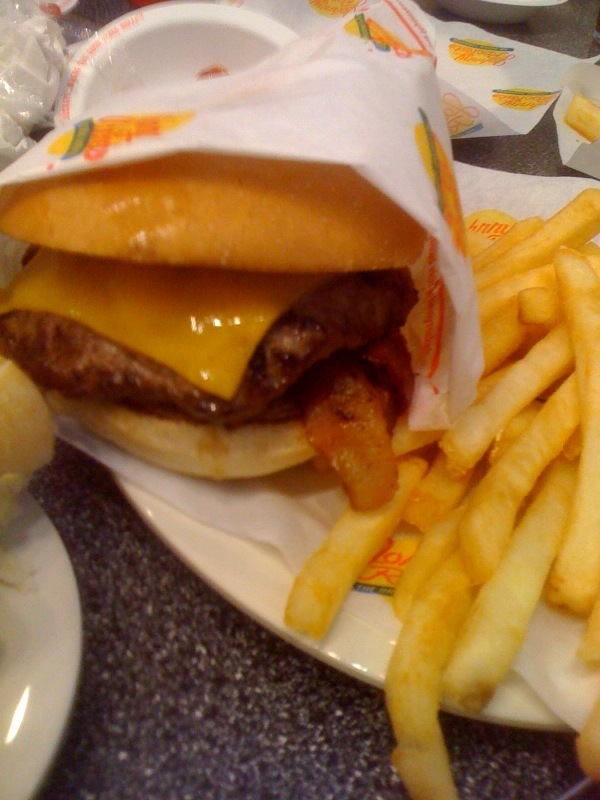 Johnny Rockets is a great spot. 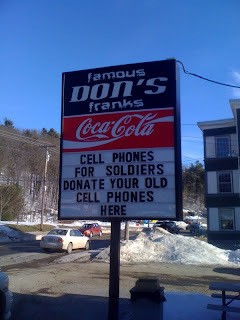 Our research field trip north took us next to Don's Famous Franks in Augusta, Maine. I'd never heard of Don's, but luckily if there is anyone that knows eating spots better than me (or at least as well as me) it's The Hot Dog King and he knew Don's. 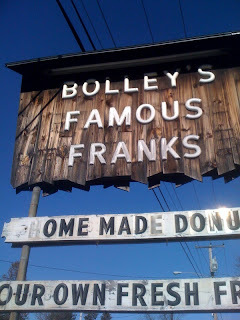 The bad news was, we had just eaten at Bolley's Famous Franks (how long does Yank's Franks have to serve hot dogs before we can call them famous?). The HDK and Double Dog Dennis were kinda full. A true researcher doesn't let that stop them. For me, it was my standard chili dog and a large order of french fries (to be shared). The menu sign said Homemade Fries, but when they arrived I noticed that they were crinkle cut. I would categorize homemade crinkle cut fries as very rare so I was skeptical. The hot dog was very good (Kayem natural casing), griddled and served on a steamed bun (if you don't know my opinion of steamed buns read the previous article). The chili was okay, but the fries....the homemade crinkle cut fries were fantastic!!! It is worth a trip to Augusta to try these fries. Frankly, Yanks Franks serves the BEST dogs! Today's research field trip took Double Dog Dennis, The Hot Dog King and me to Bolley's Famous Franks in Hallowell, Maine. My first impression of Bolley's was, WOW! they are packed. We arrived just after noon time and we had to wait for a parking space. Once inside we ordered. The HDK had a burger and fries. One of the reasons we came to Bolley's was The HDK had stopped here for lunch many months back and couldn't say enough good things about the fries. DDD ordered a burger and large onion rings. Apparently they both forgot that we were at a hot dog joint. For me it was two dogs, one with mustard and sauteed onions and the other was the chili dog. I find myself ordering a chili dog everywhere and using it as a standard by which to judge hot dog joints (and I love chili dogs). For dessert The HDK ordered us all donuts, homemade of course. Both DDD and The HDK reported that their burgers were very good. They looked good. My hot dogs (Old Neighborhood natural casing dogs) were both good, the chili was good and the sauteed onions were very good. The chili was not authentic hot dog chili, but it was good and that is what counts. The only thing I didn't care for was the bun. It was steamed, which makes it too soggy for me. I know many people prefer their bun steamed, but I'm not one of them. Both the rings and the fries were also good, but even The HDK said they were much better during his last visit. On the other hand, the donuts were probably made that morning and probably would have tasted better when they were fresh. The donuts we had were very bad. 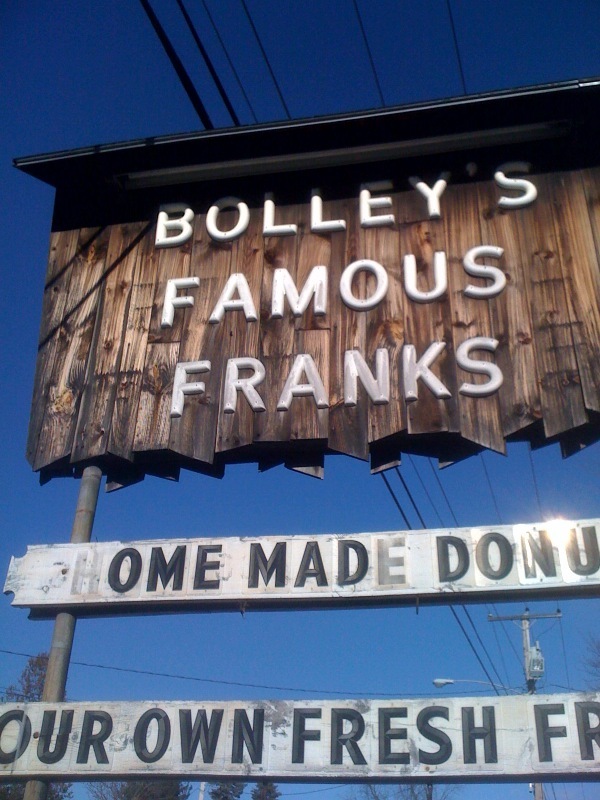 When in Hallowell, I'll gladly go to Bolley's and enjoy the hot dogs, the fries and the rings, but I'll steer clear of the donuts next time. I'll also try a burger with my dogs next time. Thanks Bolley's for a good lunch. Check out tomorrow's article here at the blog and find out where we stopped next. Just as a teaser, they had awesome Homemade Crinkle Cut French Fries (very rare and very good). The beef was in the Yank's Franks' testing labratory. Actually it was the Italian Beef, imported from Chicago the land of great politicians and even greater hot dogs. The judges were set. Each one of them, Hot Diggity, Double Dog Dennis, The Hot Dog King and me (Yank) had sworn to skip several meals prior to the tasting and arrive super hungry. I wasn't able to skip breakfast, but I did skip my mid-morning snack. Well, I didn't skip it, but I had far less than I otherwise would have. Well, not far less, but less. Hey, the point is, I was very hungry. The menu was set, and the Italian Beef sandwiches were to be the highlight. I felt we couldn't have a legitimate tasting without a sidedish so I added onion rings to balance things out. They weren't the amazing Yank's Franks onion rings, but they weren't bad. To wash it all down, we had the famous Yank's Franks Root Beer. What a meal! 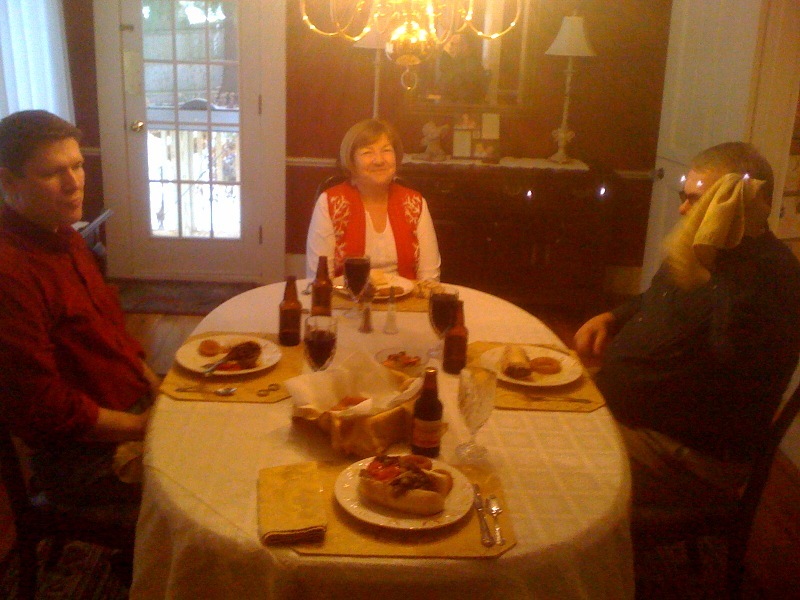 As you can see from the photo, we gathered around the tasting table for our first bite of the Beef sandwiches. What you may not know from my previous posts is, The Hot Dog King is in the Witness Protection Program (you now understand why his title The Hot Dog King doesn't include his name) so his face had to be obscured to protect his identity. 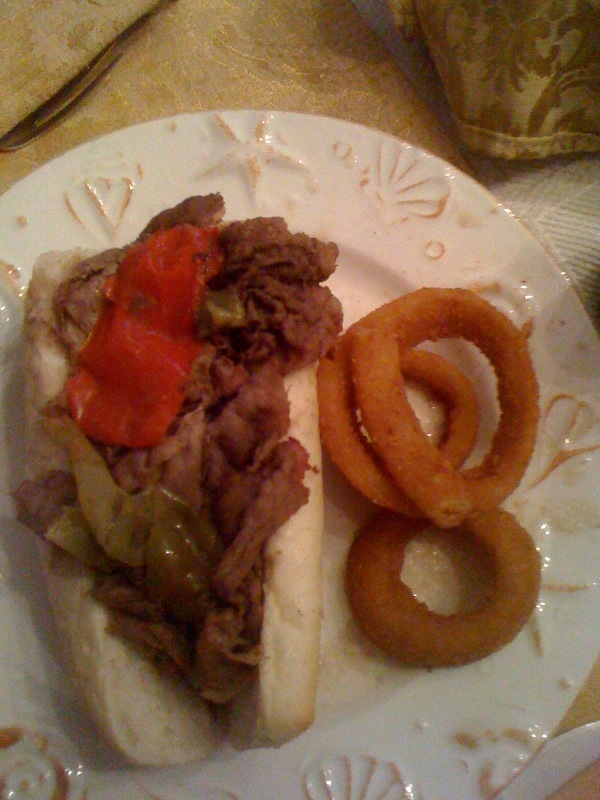 The Italian Beef was made by taking very thinly sliced roast beef which is placed briefly into Au Jus gravy and then onto a warm and crispy bread roll. Then you add a ladle of Au Jus gravy followed by some cooked sweet peppers to finish this awesome sandwich. Some people (me in particular) like to have their sandwich topped with Hot Giardiniera. It was delicious, I mean delizioso! I always said I'd like to get a job eating or testing mattresses. One more check mark on my Bucket List. Even though Yank's Franks won't be opening until May, we continue to do research to bring our customers the best eating experience possible.